Jerry Barnes is a funky man. One would have to be if they wanted to hold the bass chair for NIle Rodgers and Chic. Not only has he kept the mighty groove of the late Bernard Edwards alive but his own groove has been featured on hundreds of recordings from artists as diverse as Roberta Flack, Bette Midler and Harry Belafonte. But Jerry Barnes is much more than sublimely funky bass playing for what makes Barnes a great bassist is the fact that he is a great musician. And it is this all-encompassing ethos that has carried Barnes through his rocket ride career as not only a bassist, but a producer and songwriter. On a cold March day, we gathered at a swanky, gourmet donut shop in New York’s Chelsea neighborhood. That day, the day before before Chic joins Duran Duran for their Paper Gods US tour, BMM sat with Jerry to get the skinny on his long career, his many projects and his new signature bass! How did you begin your musical journey and discover the bass? My Dad was a manager of different bands when I was a kid and instruments were always in the house. I would mess around with things – you know 5 minutes here, 10 minutes there. Just for fun. I first started playing drums and practicing that for a little while but I didn’t really gravitate towards them. Plus, we didn’t have a full kit! There was a bass there that some guy had left at the house; it was from Italy or Germany called EKO. So I ended up gravitating towards that and I started practicing on one or two strings – I don’t remember how many strings were on there! From there, my father asked me if I wanted to get a new bass and of course I said “yeah”! We went to a local store in Raleigh and I picked – because of the looks actually – a Kramer bass, which was about 20 lbs.! I didn’t know that the basses that I were listening to, or the sound or tone that I was gravitating towards was P Basses and Jazz Basses but I didn’t know it was a style of a bass at that age – 14/15. I was talking to Freddie Washington and he said the first bass he bought was a ‘71 P Bass! So his first bass was actually a great, traditional bass. I don’t want to diss Kramer, I’m just saying it didn’t sound like the tones of the records that I was listening to. And I was so frustrated with that for years! I kept trying to tweak my amp and you know, back then we didn’t have a tweeter! Eventually, around 1979 or so, I dropped the Kramer by accident and the neck split and I ended up borrowing a friend’s Fender Jazz and I was like “Ohh, this is the sound”! Who were you listening to around that time? I was listening to Nathaniel Phillips from Pleasure, The Isley Brothers, The Gap Band, The Doobie Brothers, Bernard Edwards from Chic. I mean at that time, all the basses were loud on the recordings, so it was just, “wow”! That was the beginning really. How did you develop your technique so quickly? You were playing regular gigs at an early age. We used to do Top 40 shows or whatever was on the Top 40 at that time, so I would learn the bassline and try to get as close as possible. That was the beginning of learning bass and structure in Pop music. I didn’t have a teacher, I taught myself. 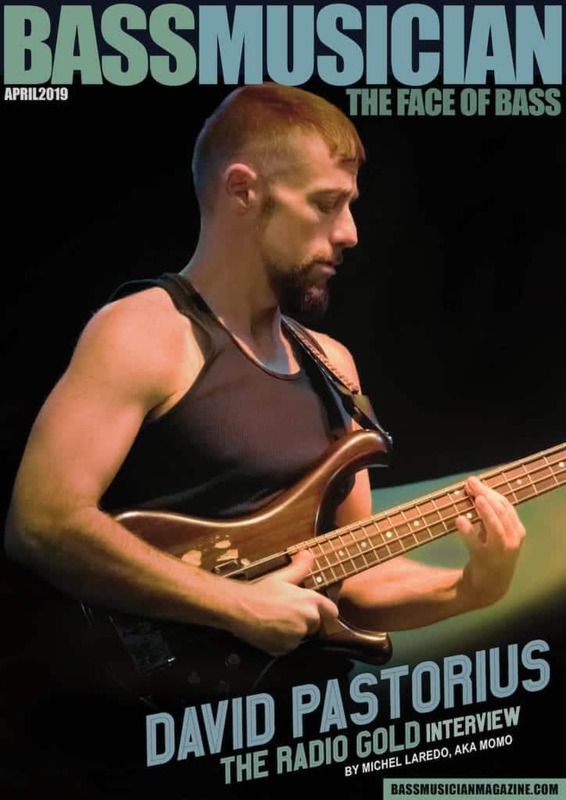 I looked at pictures from my Mel Bay bass book and I would just try to always keep my fingers in a certain position so I could keep my technique like the pictures! That’s how I trained my hands. And then I just practiced! In North Carolina where we lived, we had a lot of time then to just practice and that’s how I started. You went through that circuit and were signed early on correct? Our first record contract was with Clive Davis in 1980. Deodato was our producer. Evand Kelly and Charlie Williams were the songwriters. We were writing as well but they were part of the production deal. To be honest with you, the reason why I don’t know a lot of songs, is because of that dynamic. I was practicing but I only practiced what I needed to learn and then we wrote original music which is your own. So that’s my foundation as a bass player. We started out as The Third Generation and then we became Juicy and that was with Clive Davis for Arista Records. Then we were dropped from Arista and we were picked up by Epic and we had a hit called Sugar Free in ‘84/85, maybe ‘85 it was released. And we toured and opened for a lot of classic R&B bands like SOS, Lakeside, Zapp – Roger Troutman and Zapp – we even did an episode of Soul Train! I was like 18/19 and being hit with all this! When we came to New York in the mid-80’s, Deodato had had big hit records with Kool & The Gang: Celebration, Reggae Dancing, Joanna… So he was hit with a lot of obligations and he would hire us to do tracks or pre-production and post-production work. Also, he would use our songs, so we were writing for these artists that he was signing or working with. And at that time we met Shirley MacLaine, Harry Belafonte, Roberta Flack, Chaka Khan… we worked on all these records with all these eclectic artists. Even Larry Graham – I played bass on one of his albums before he played his bass lines! I did the pre-production on an album that he put out with Deodato as producer. [Ed note: 1985’s Fired Up] So I met him and it was amazing! It was like, “I’m doing the reference bass for Larry Graham!”. It was crazy! And that’s where we honed our chops as producers, as writers, as sessions musicians. Then when we moved to New York in ‘88, we met Arif Mardin and at that point, we were part of his family – his musical family. Our first session with Arif was me, Anthony Jackson and Greg Philligaines and it was a song that I wrote called Friday. So imagine me, people that I looked at the record credits, were together playing my song with Roberta Flack, with Arif Mardin as producer; and I was really overwhelmed! And Katrisse [Barnes, Jerry’s sister] and I both at that point, really got into the New York session circuit and we just plowed through! Some of the artists that I worked were a combination of studio and live work – Roberta Flack, Carly Simon, Bette Midler, Chaka Khan. But most of my session work was just in the studio, I didn’t gig with the artists. What were some of the lessons you have learned going into sessions with different artists? Well, I tell you this much; the 80’s were torture for me! The records that I listened to were all with a live band whoever it was; Sly, Al Green, whoever. And in the 80’s everybody was using drum machines. My lesson was: Don’t get stuck with a trend as a musician or an artist! There were bands that had live bands and that sold but the majority of them were a DX-7 keyboard, Lynn drum or DMX drum machine. So the whole chain of Prince and Janet Jackson even some of the pop bands from all over the world; it was all drum machine heavy whether it was INXS, Nile. And I personally, my lesson was learned to not follow the trend. And the first chance I got, to be a producer or writer, I tried to use a live band. Even if we were editing them to sound more rigid or more commercial to the Top-10, iTunes scene. How about with artists that you produce? I try to give what the artist wants so if they want to be more commercial, you sort of have to listen at what’s going on and find some, I wouldn’t say compromise but find some middle ground between who they are and what’s out there. How about Jota Quest, you have done a few records with them at this point correct? Yeah, this is the second one [Ed. note 2015’s Pancadelico]. It’s a really big record there. Chic did a show in Sao Paolo about six years ago and they opened for us. And the bass player had my instructional tape [1999’s Funk/R&B Bass] and he came up to me and we just started talking about bass and he said “Would you be interested in working with us in the future? We need a producer, come down and do a song or two”. Funny story, three years later the scheduling works out so where I can finally go there and I land at 9 in the morning, check into my hotel and I go meet them at the studio, which was beautiful, top of the line. Now he knew me but the band didn’t really know me, so we get into their studio, we set up everybody and I said, “This is what we’re gonna do guys, let me listen to your music”. So we listen to about 50/60 tracks, ideas, concepts and they had a couple that were really clear – I knew they were strong records. So I said “Let’s do those and just play live”. And they were like, “Huh”? Well they play live every weekend but when they record, they mostly overdub everything and loop drum beats but I said “let’s just plug in, go through the tunes and do some takes”! I was the second guitar player – on most of their records I’m playing guitar – and we did two songs in about 45 minutes! So basically, I had fulfilled my contractual request (laughs) by 2/3:00 that afternoon! And they were looking at me like, “well, your ticket is for another ten days! Do you wanna do some more songs?” And I was like, “let’s do it!” So we ended up cutting 15 whole songs by the end of my 7th day there! The album was done. We couldn’t even put all the songs on the record! They called me the “6th Beatle” since there are 5 guys in Jota Quest. But they are really talented, they have good songs. And it all started from the bass player coming up to me and us talking. Then three years later we do a record, which ended up becoming a ‘comeback’ record for them in a way because they had been around for awhile, and this record is a smash; it was like the Get Lucky in Brazil! It was on the radio everywhere and it was exciting! The past five years have seen Funk music go through something of a rebirth in terms of its influence on so many new artists but also for legacy acts. Well, we always had young people at our shows. Chic would always play festivals and we built our audience, even before Get Lucky, we became a festival act. So we now have a great cult following, a core following, and that was from gigging and doing good shows. Get Lucky just put us over the top as far as Nile’s recognition and rebirth in a way. Actually, I wouldn’t even say rebirth, it was a birth because he was a ‘new artist’. What do you think about that? The Chic records were a production team – him and Bernard [Edwards] – but the Get Lucky introduction to the world was a ‘guy’. It wasn’t about the band, it wasn’t about Chic. So he had a birth as an artist, as a brand which helped the band, in my opinion; more visibility, more gigs. And the thing about the band is that the show is so good, so strong, that the little extra nudge took us to another level. I remember with Chic, where we would do 10/20 shows a year…17 years ago! During the Get Lucky run we did almost 150 which for us, was a lot! I think Jota Quest does almost 200 shows a year in Brazil! So it’s been a very, very exciting ride! Tell us about your signature model bass from Atelier Z. My theme, my slogan is – it’s not about the bass. It’s about being an artist, it’s about being a musician. It’s about being open and learning other instruments, transcribing or learning other tunes, or writing. I love Pop music so I’m a Pop songwriter – that’s been a focus of mine since I was a kid. So my advice to a bass player – it shouldn’t be about one thing because all of these elements are a part of you.